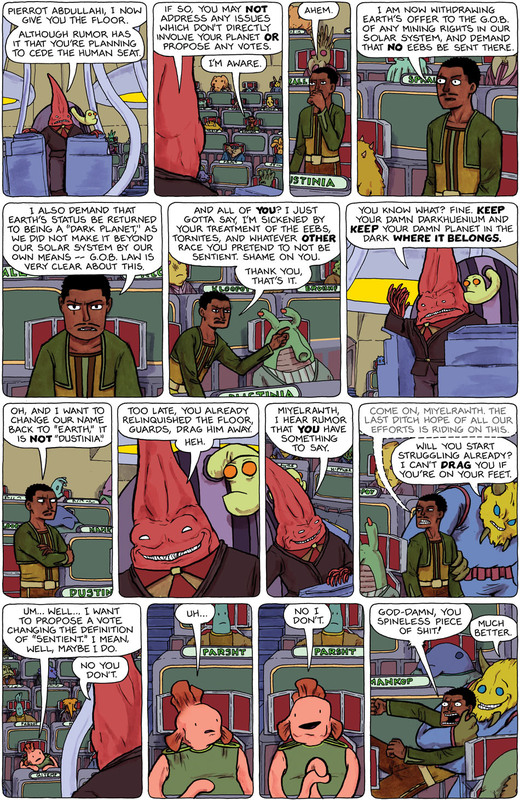 And I have a few nice links for ya: Elsanto gave Spacetrawler a 5 star review over at comixmedia, and Lys talks about me as one of her favorites over at YourKloset. Thank you! Man, how the heck do THEY qualify as sentient? Oh, and I figured out a way to save the Eebs. Get them to make robot ships/soldiers/diplomats that are programmed to protect Eeb interests. Have them act as a buffer between Eebs and other races. With no direct contact, the other races can’t take advantage of their suggestibility. Not something they can realistically pull off by themselves though, and it would take a long time to rescue the remaining Eebs. Erm… well, I guess when we Dustinians make it on our own we can have them change the name back? I can’t recall how many times I’ve had that EXACT same thought about our elected officials as of late. Well said, Pierrot. @Abeo, they qualify as sentient because they shut up and do as they’re told in the face of overwhelming force. I guess the question of whether or not my daughters count as “sentient” depends on if you consider my saying “NO!” counts as overwhelming force. good to see galatic politics plays out the same as it does at home…yeesh. @Christopher, but… but… they’re so SMART! How can they not count as “sentient”? Maybe I just have to wait a few years until they have jobs and children of their own. Does having children make you “sentient”-er? I guess it shows either my frame of mind or my laptop’s screen resolution that in frames 13 and 14, I was reading the name of the species behind Miyelrawth as “PARENT”. Heh, I think the Qiyemps are my favourite alien race. Such a happy guard lol.